As the office manager at The Fuller Center for Housing’s headquarters, Cathy Smith is a stickler for details and helps keep operations marching smoothly forward. That might not be such a difficult task for most offices of just a dozen or so people; but while Fuller Center headquarters has about a dozen people hard at work on a typical day, it’s definitely not your typical office. When people are not emailing construction leaders in Armenia, they’re ordering T-shirts for a project in Peru. When they’re not calling covenant partners in New Jersey, they’re on Skype with an American who lives in El Salvador but is working in Haiti with a group from Brazil. When they’re not driving to visit a U.S. covenant partner in Indiana, they’re flying to visit a covenant partner in India. When they’re … well, you get the picture. Amid the intercontinental flurry of activity required in running a Christian housing ministry determined to change the entire world one house at a time, Smith keeps everyone grounded in the simple headquarters building located in Americus, Ga., occasionally reminding people who just want to do God’s work by building homes for people in need that saving the world in today’s day and age often requires a little paperwork before they go off on some adventure in the Democratic Republic of the Congo or Nepal. In short, she has to make sure the not-so-adventurous details are handled. 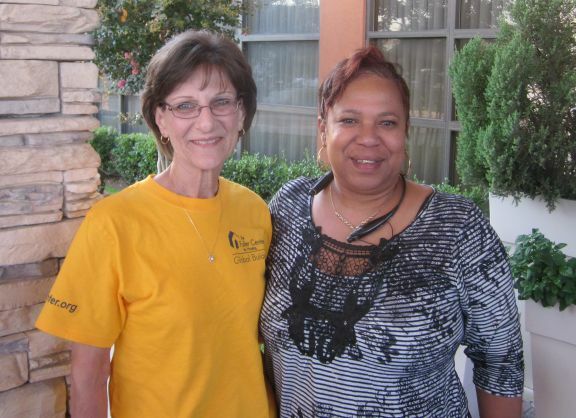 Cathy Smith, left, meets Bridgette Miller, leader of The Fuller Center’s covenant partner in Waxahachie, Texas. But Smith embarked upon an adventure of her own last week when she was convinced to tag along with Brenda Barton, The Fuller Center’s communications liaison for U.S. Operations, on a truck driving adventure from Texas to Georgia with a load of building materials donated by World Vision, a like-minded Christian organization dedicated to lifting children out of poverty. In addition to the practical purposes of obtaining materials for Henry County, Southwest Quarter and the Chattahoochee Fuller Center Project to help them complete projects, it was a chance for Smith to visit family in her native Texas, spend a lot of time with a colleague who also is a good friend and to finally do what so many around her at the office regularly get to do — see for herself what Fuller Center covenant partners have been able to accomplish beyond Americus. Among the places she visited was the Allendale community of Shreveport, La., where The Fuller Center for Housing began building its first homes in 2005. With 43 new homes in the neighborhood, the formerly crime-ridden area of blight (which local law enforcement once encouraged The Fuller Center to avoid) is now a shining example of how a community can be lifted up and transformed by simple, decent housing. It also stands as a testament to the determination of two men — Millard Fuller, the Fuller Center president who died in 2009; and Glen Barton, the Fuller Center’s vice-president of U.S. Operations who died last year — who refused to believe that Allendale could not be saved. Though some at headquarters joked about visions of Smith and Barton chomping on cheeseburgers at truck stops and dodging “smokeys” on the highway, the reasoning behind the trip to World Vision’s warehouse in Dallas was purely practical — to collect a generous load of in-kind donations. The Fuller Center’s relationship with World Vision is something Glen Barton was cultivating last year before his untimely death and one that his wife Brenda is carrying to fruition. Cathy Smith poses with World Vision’s Adam Roberts, left, and Jacob West inside the massive World Vision warehouse in Dallas. Though he was left all week without Smith to keep him in line from the desk nearest him, Director of U.S. Field Operations Kirk Lyman-Barner was wholly supportive of the journey — although he may have dished out a truck stop joke or two himself. As for Smith, she may no longer be “East Bound and Down, loaded up and truckin’,” but the momentum from the journey has not subsided. “This experience has rejuvenated and inspired me in a way that is so difficult to explain,” she said. “It has inspired me to want to think more ‘outside the office,’ to think of ways that I can help them reach their goals and insure continued success — not just with the paper end of it all, but how I can be someone they can freely call upon and ask for help or support. Fuller Center Director of Communications Chris Johnson said he was disappointed he could not flush out any wild and crazy stories from the road.